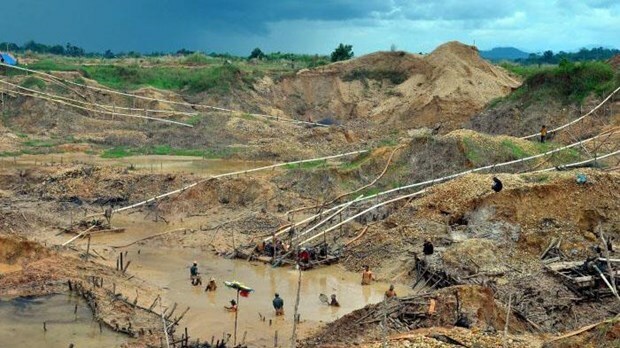 Jakarta (VNA) – A search and rescue team on April 9 rescued two miners and found five dead bodies after a landslide hit an artisanal diamond mine in Banjarbaru, South Kalimantan province of Indonesia a day earlier. National Disaster Mitigation Agency (BNPB) spokesperson Sutopo Purwo Nugroho said that the accident occurred on April 8 afternoon in Sei Pumpung village. It was caused by unstable soil conditions mixed with sand and gravel, due to heavy rain that has been pouring down since the morning. When the landslide hit, seven miners were working at the site, with two being in the upper section of the mine and the remainder in the lower section. The bodies of the dead miners have been handed over to their respective families to be buried, he added. According to him, similar incidents are a common occurrence, which have claimed the lives of many local residents.